Slow CaAl-NaSi interdiffusion in plagioclase crystals preserves chemical zoning of plagioclase in detail, which, along with strong dependence of anorthite content in plagioclase on melt composition, pressure, and temperature, make this mineral an important source of information on magma processes. A numerical model of zoned crystal growth is developed in the paper. The model is based on equations of multicomponent diffusion with diagonal cross-component diffusion terms and accounts for mass conservation on the melt–crystal interface and growth rate controlled by undercooling. The model is applied to the data of plagioclase rim zoning from several recent Bezymianny Volcano (Kamchatka) eruptions. We show that an equilibrium growth model cannot explain crystallization of naturally observed plagioclase during magma ascent. The developed non-equilibrium model reproduced natural plagioclase zoning and allowed magma ascent rates to be constrained. Matching of natural and simulated zoning suggests ascent from 100 to 50 MPa during 15–20 days. Magma ascent rate from 50 MPa to the surface varies from eruption to eruption: plagioclase zoning from the December 2006 eruption suggests ascent to the surface in less than 1 day, whereas plagioclase zoning from March 2000 and May 2007 eruptions are better explained by magma ascent over periods of more than 30 days). Based on comparison of diffusion coefficients for individual elements a mechanism of atomic diffusion during plagioclase crystallization is proposed. Gorshkov G.S. Determination of the explosion energy in some volcanoes according to barograms // Bulletin Volcanologique. 1960. V. 23. № 2. P. 141-144. Gorshkov G.S. Directed volcanic blasts // Bulletin Volcanologique. 1963. V. 26. P. 83-88. Gorshkov G.S. Gigantic Eruption of the Volcano Bezymianny // Bulletin Volcanologique. 1959. V. 20. № 2. P. 77-109. Gorshkov G.S. Intra-oceanic Islands, East Pacific Ridge, Islands arcs: volcanism and upper mantle // Tectonophysics. // Tectonophysics. 1969. № 8. P. 213-221. doi: 10.1016/0040-1951(69)90098-5. Gorshkov G.S. Kamchatka Valley of Ten Thousand Smokes // Bulletin of the Volcanological Society of Japan. 1959. V. 3. V. 2. № 2. P. 154-156. Gorshkov G.S. 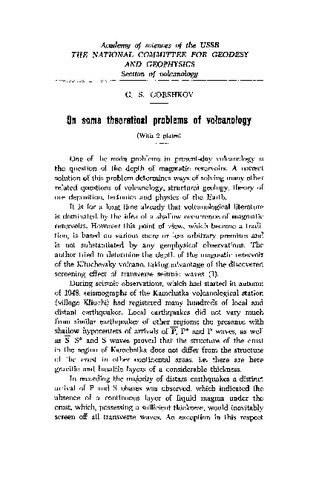 On some theoretical problems of Volcanology // Bulletin of Volcanology. 1958. V. 19. № 1. P. 103-114. doi: 10.1007/BF02596600. Gorshkov G.S. 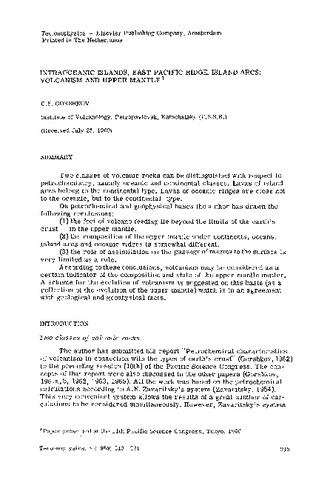 On the Relation of Volcanism and the Upper Mantle // Bulletin Volcanologique. 1965. V. 28. P. 159-167.